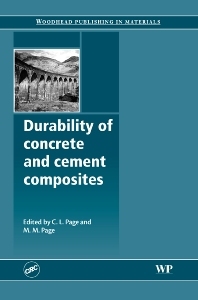 Physical and chemical characteristics of cement composites; Dimensional stability and cracking processes in concrete; Chemical degradation of concrete; Corrosion and protection of reinforced steel in concrete; Degradation of pre-stressed concrete; Concrete aggregates and the durability of concrete; Degradation of concrete in cold weather conditions; Degradation of fibre-reinforced cement composites; Degradation of polymer-cement composites. Whilst most structures made using concrete and cement-based composites have not shown signs of premature degradation, there have been notable exceptions. In addition, there is increasing pressure for new structures to remain in serviceable condition for long periods with only minimal maintenance before being recycled. All these factors have highlighted the issues of what affects the durability of these materials in different circumstances and how material properties can be measured and improved. Durability of concrete and cement composites summarises key research on these important topics. After an introductory chapter, the book reviews the pore structure and chemistry of cement-based materials, providing the foundation for understanding the particular aspects of degradation which are discussed in the following chapters. These include dimensional stability and cracking processes, chemical and microbiological degradation of concrete, corrosion of reinforcing and prestressing steels, deterioration associated with certain aggregates, effects of frost and problems involving fibre-reinforced and polymer-cement composites. With its distinguished international team of contributors, Durability of concrete and cement composites is a standard reference for all those concerned with improving the service life of structures using these materials. Dr Chris Page is Professor of Civil Engineering Materials in the School of Civil Engineering at the University of Birmingham.